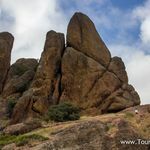 Pinnacles National Park is not very well known Park because it is the newest. This is a good thing especially in California where the national parks get very busy starting with the spring are become very difficult to visit getting very busy with tourists. Pinnacles National Park was very easy to visit since they were not that many people even on a Saturday. Our children enjoyed two great hikes which were also a lot of fun.